Excess eyelid skin with or without bulging fat pads is the reason why people consider eyelid surgery. It is one of the most popular and frequently performed cosmetic surgical procedure in the world. With time, the eyelid skin becomes lax and the underlying tissue (fat pads) may start to bulge out. Years of sun damage, genetic predisposition, chronic health issues and cigarette smoking often accelerate this phenomenon. Younger people with genetically inherited excess fatty tissue around the eyes may also elect to have this procedure to achieve a more defined upper eyelid crease or to get rid of bulging lower lid fat pads. In some patients, blepharoplasty can also improve the eyesight by providing a less obstructed field of vision caused by excess upper eyelid skin. What are the common types of Blepharoplasty and Eyelid skin Rejuvenation procedure? For removing lower eyelid fat pads alone, a “trans-conjunctival” blepharoplasty is performed where the incision is made inside the lower eyelids, leaving no visible scar on the outside. As the name suggests,Tissue-sparing Blepharoplasty means a minimally invasive surgery where just the excess Eyelid skin is removed. Deeper structures such as Eyelid muscles and fat pads are left intact. This procedure is suitable for patients who just have excess skin and no bulging fat pads. 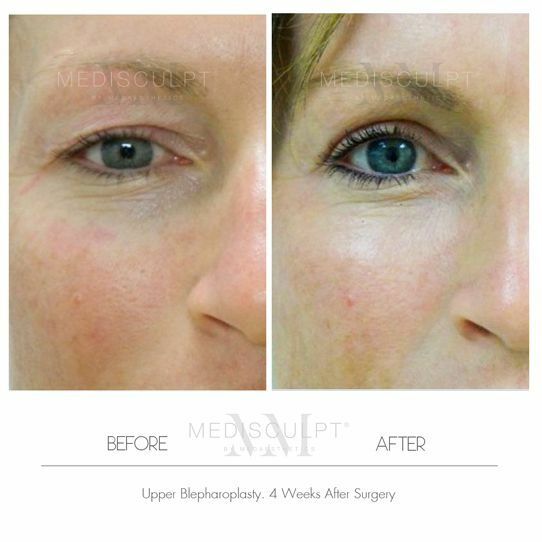 At Medisculpt™, we prefer Tissue-Sparing Blepharoplasty for most patients. Behind the Scenes : The consultation to surgery with Dr Jadoon. Upper Eyelid Lift Explained !